Pre-need and a Work of Art...Cheers to another 40 years! 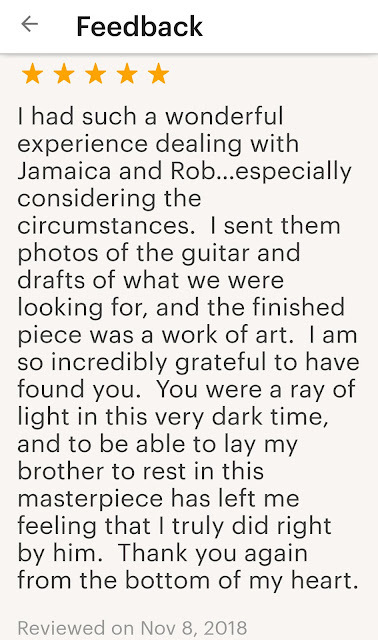 It isn't too often that we get an order for pre-need arrangements... so, it was a different kind of experience to connect with Robin regarding her memorial artwork...rather than a mournful event. She had come across our YURN listing previously.... So, with an approaching heart surgery and the encouragement of her daughter, she decided to go ahead and purchase the urn she wanted for herself. 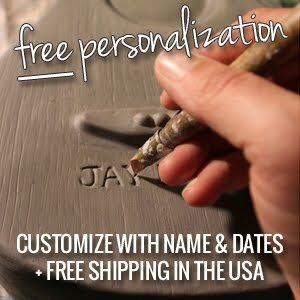 And, Lord willing, she would would be able to enjoy the piece as a work of art in her home, for many years, until the time comes to utilize it as a functional cremation urn. 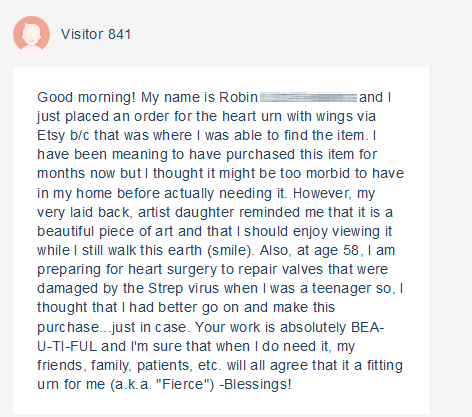 We love the thoughtfulness she put into her decision, for her daughter and her outlook regarding our "art". 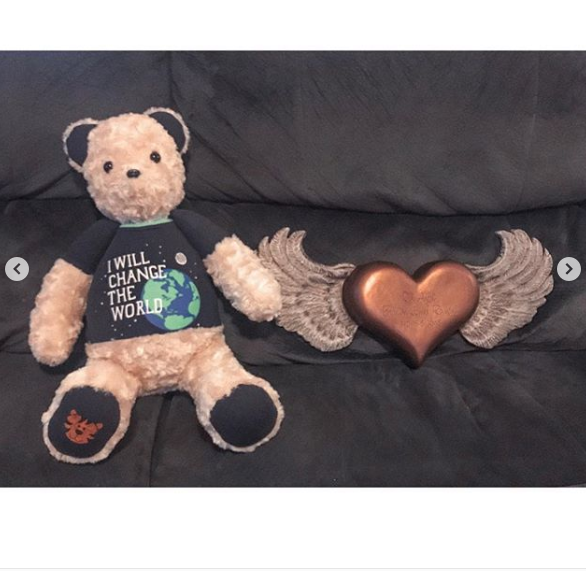 It's so touching to know that our art brings value and comfort to those grieving, and also to those who can enjoy them as artful home decor, prior to needing them for their intended purpose. We enjoyed getting to know more about Robin through this experience. 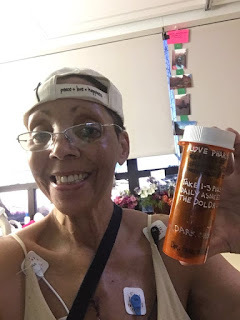 Her career in healthcare and God-centered passion for helping others, her love of traveling, and her overall fun personality and zeal for life. 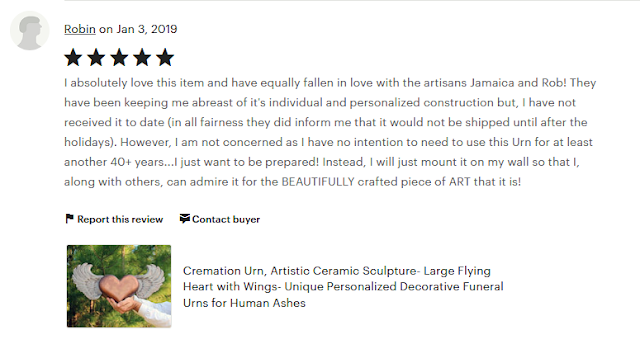 While working on her piece, we were surprised to wake one morning to read the sweetest five-star review on our Etsy store.....we hadn't even completed or shipped her memorial yet, and still she gave us a glowing review! How awesome! We completed Robin's Heart sculpture and she received it prior to her surgery. 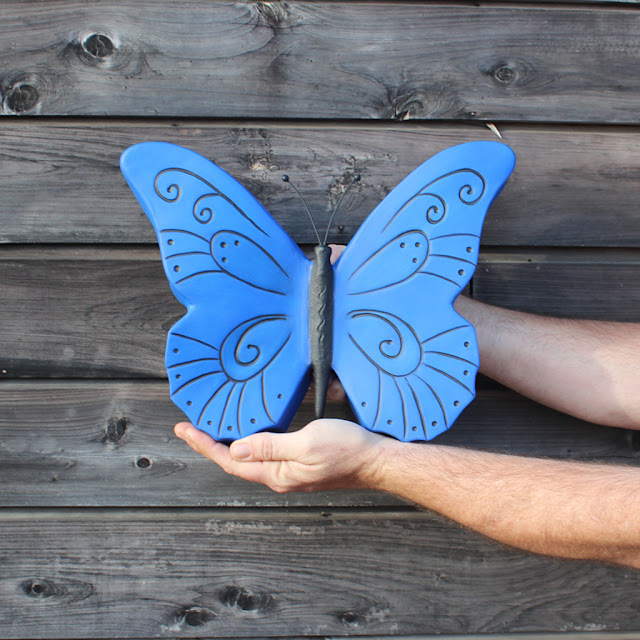 For an Australian family, who wanted a special blue butterfly urn to symbolize their dad. 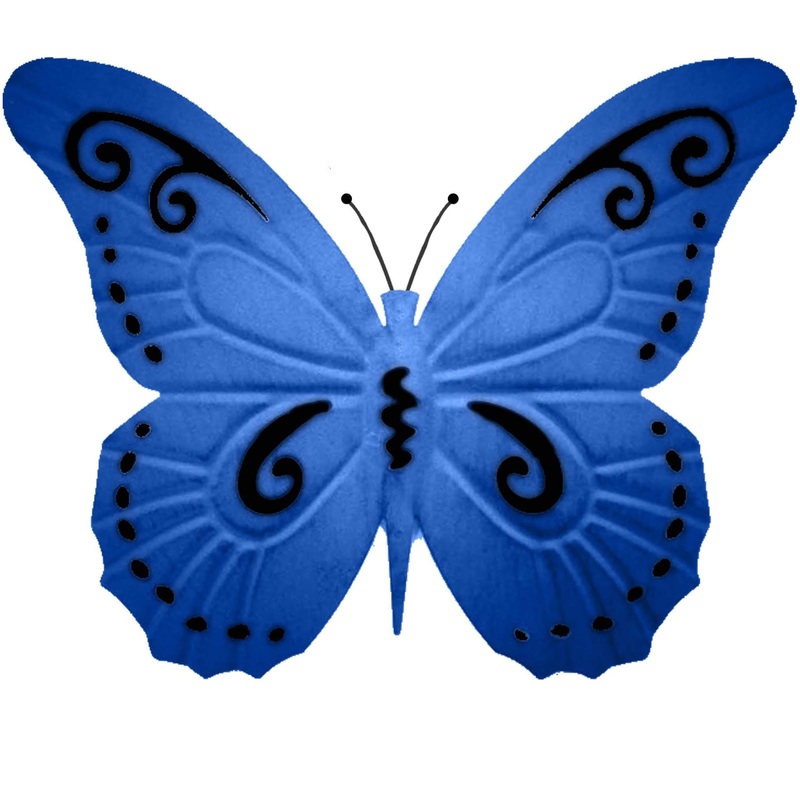 They shared with us butterfly images they liked...including an image of a blue butterfly print that has hung in their home for years. 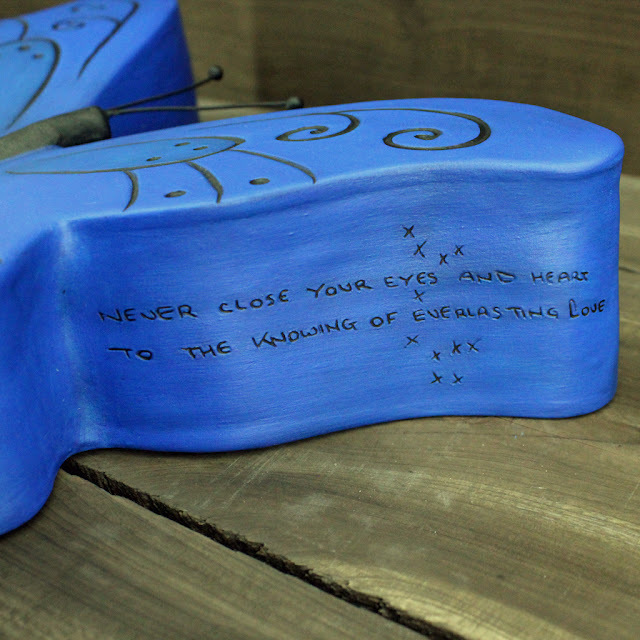 For their dad, an Interior Designer, they specifically wanted the piece to be a vibrant matte blue, and to include a special handwritten quote he had written to them. 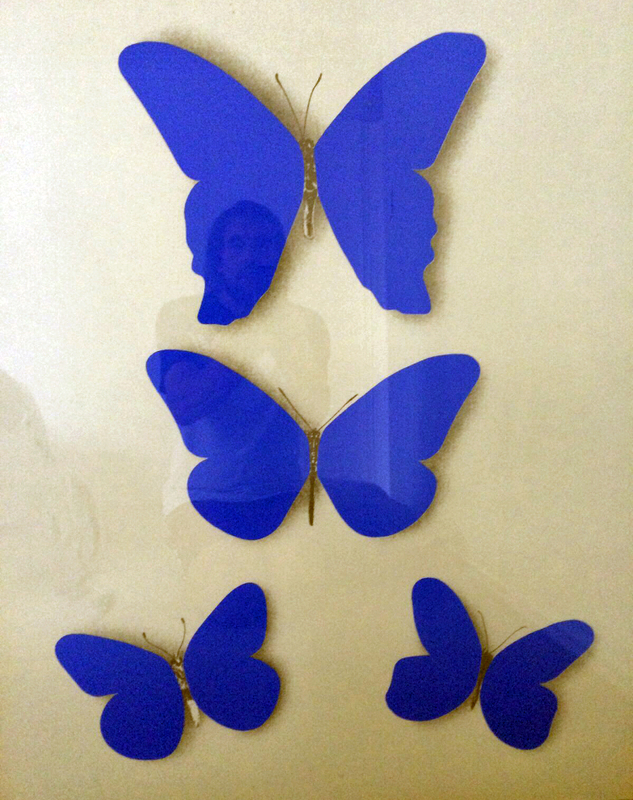 We worked with them to create a design concept of the butterfly's shape and wing pattern. 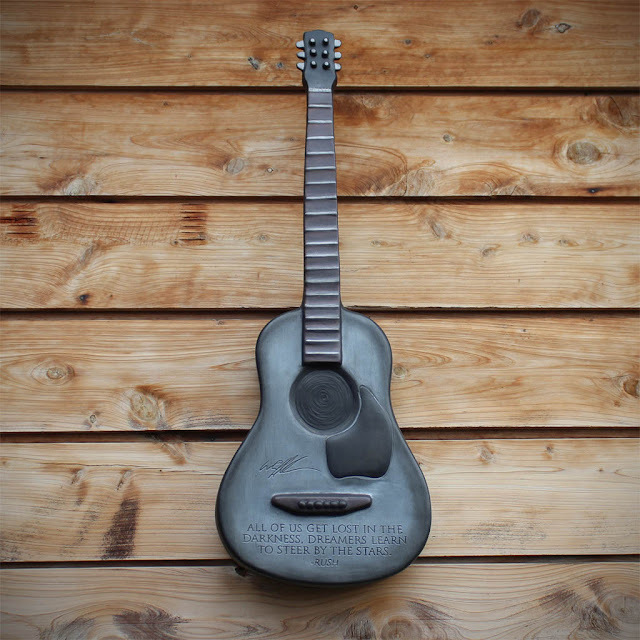 For an Alabama Coast Shrimp Boat Capt’n…who lived and loved fully, unabashedly, his own way. 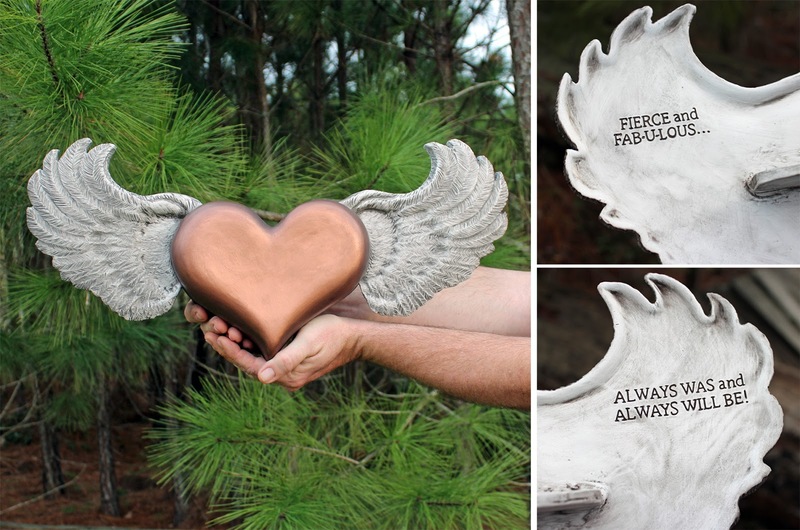 These shrimp boat urns were handmade in his honor, for each of his three sisters. 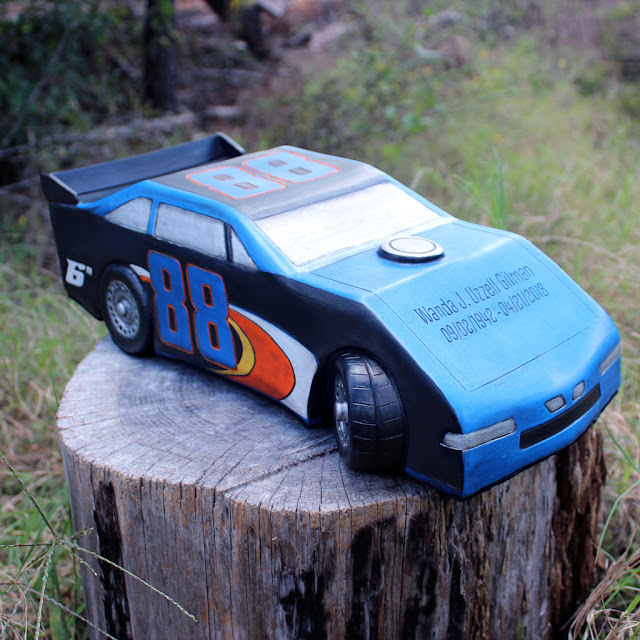 Made for a local friend, Kathy, and her family...she would tell stories of her brother Doug's adventures and trials, big wins and pitfalls. Doug was known for his kind heart and unconventional style. 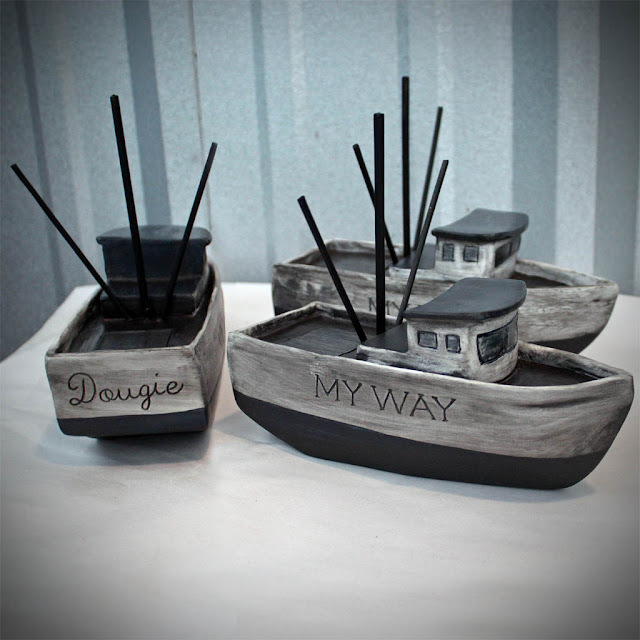 The last boat he owned was fittingly named, "My Way". Will was described as loving life and everything about it. His wife, Paula, wanted something related to nature to remember him...maybe a Pine Tree or nature scene? 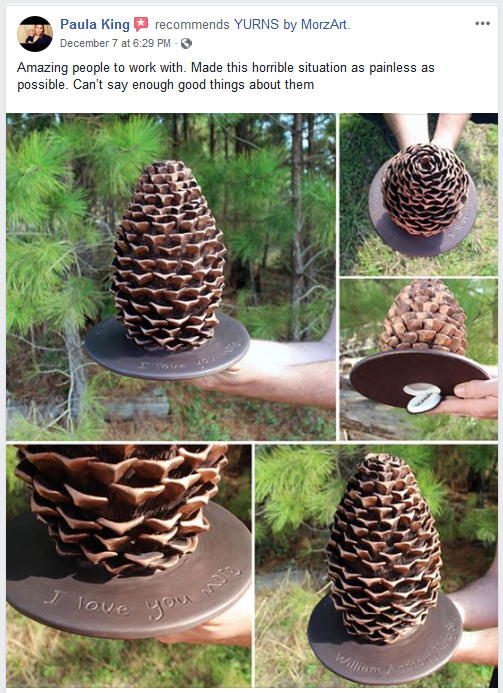 We suggested that a Pine Cone urn would be cool and she agreed. They were married in Lake Tahoe and she saved a pine cone from their time spent there together. Following his passing, Paula returned to Lake Tahoe for some needed time and reflection. She took along Will's cremains and scattered a portion of the ashes there in remembrance of him and their union. Pine trees hold a special place in our hearts too. 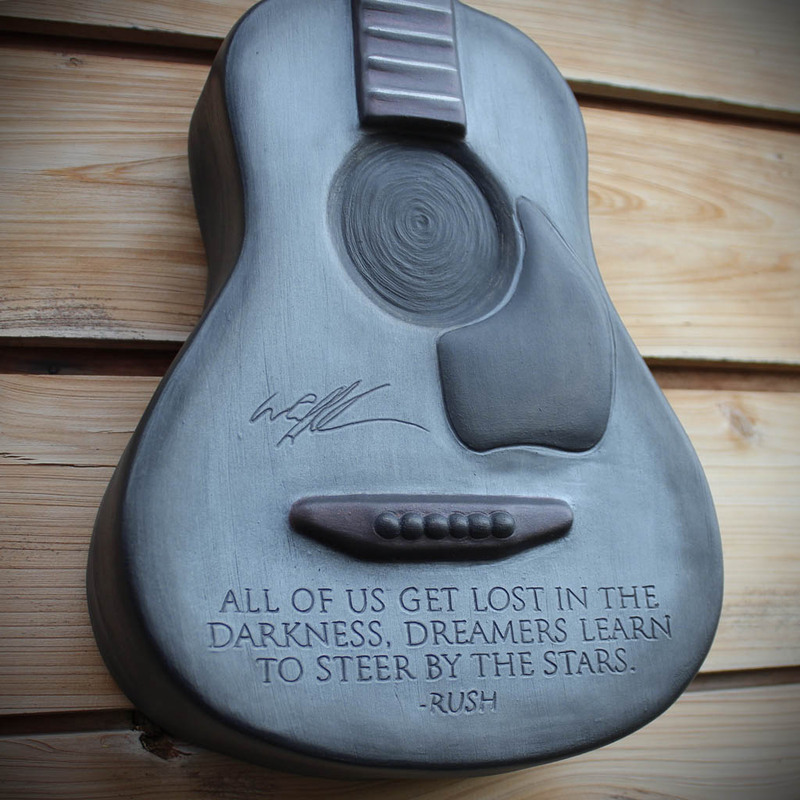 We loved creating this piece to honor Will. We hope that it offers Paula, and their family, some comfort and beauty in their time of mourning and in the years ahead. 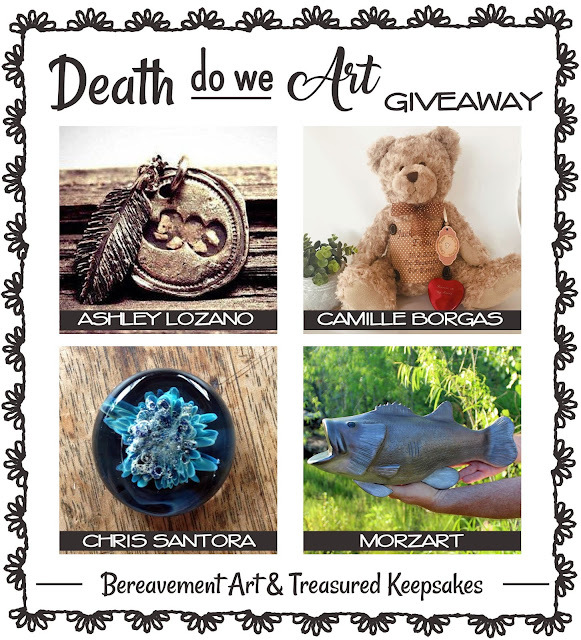 We are excited to announce this special giveaway from a collective of four After-Life Artists. 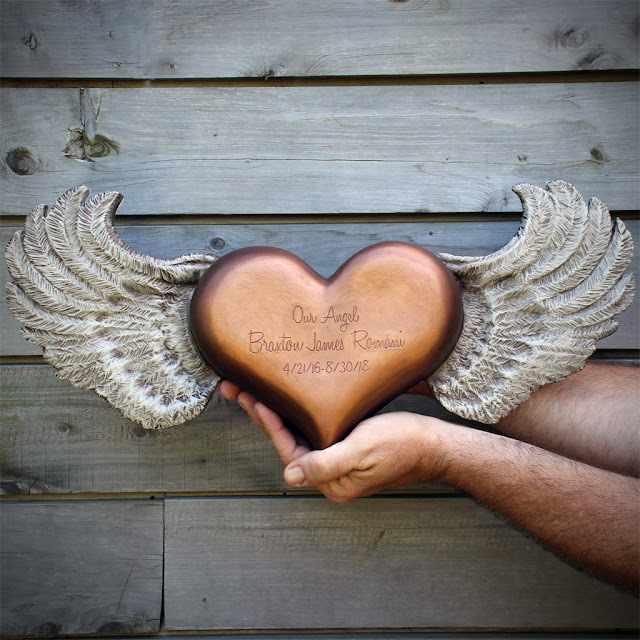 We have joined together in this special offering of our unique and treasured memorial art. 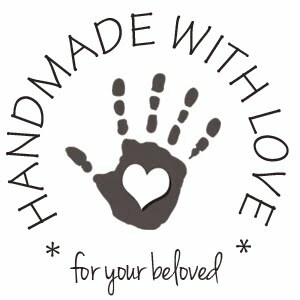 We work with our hands and from our hearts, to honor lives and bring comfort to the bereaved. 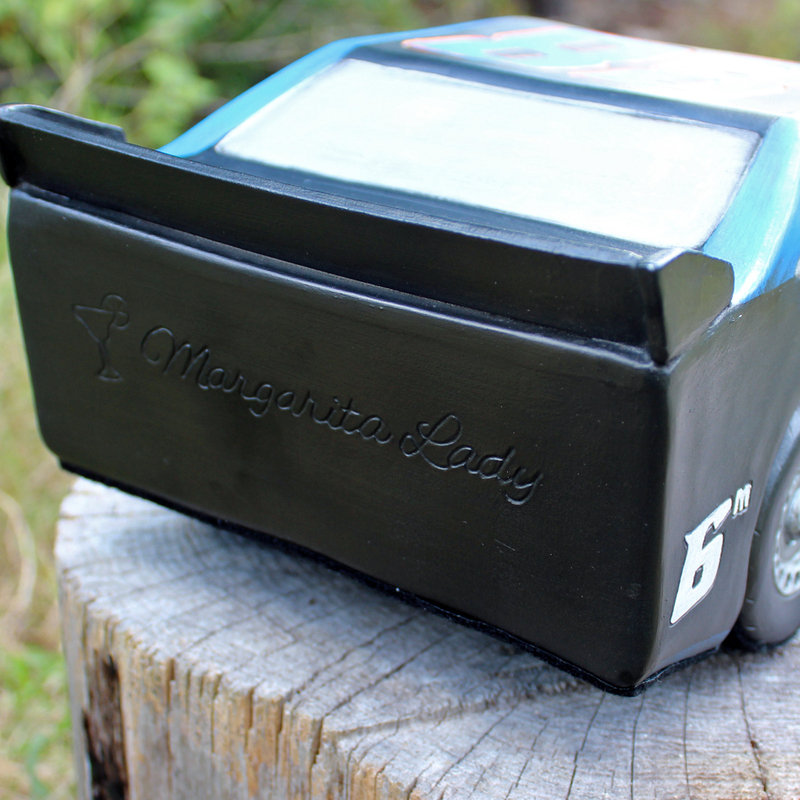 Submit your entry for a chance to win one of four prizes. Each Friday from Oct. 12 to Nov. 2, one winner will be selected, at random, to win the prize for that week. Prizes totaling over $1,000.00 in value! 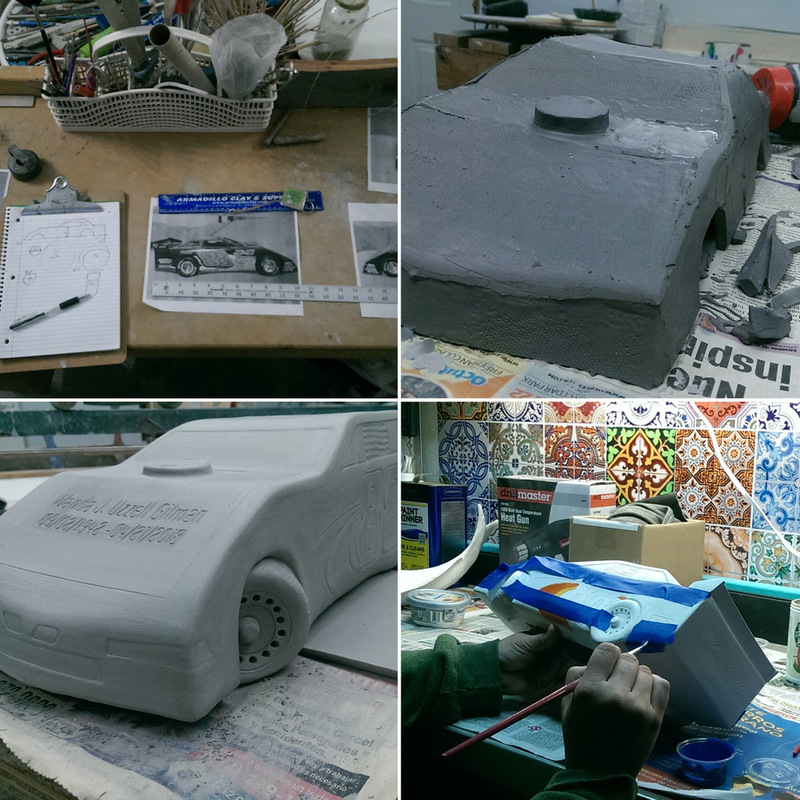 Recently, we were asked by friends of the family to sculpt an urn for their loved one Joe. Joe loved to ride his motorcycle, and was affectionately known as "Cowboy" to his bike club friends and loved ones. 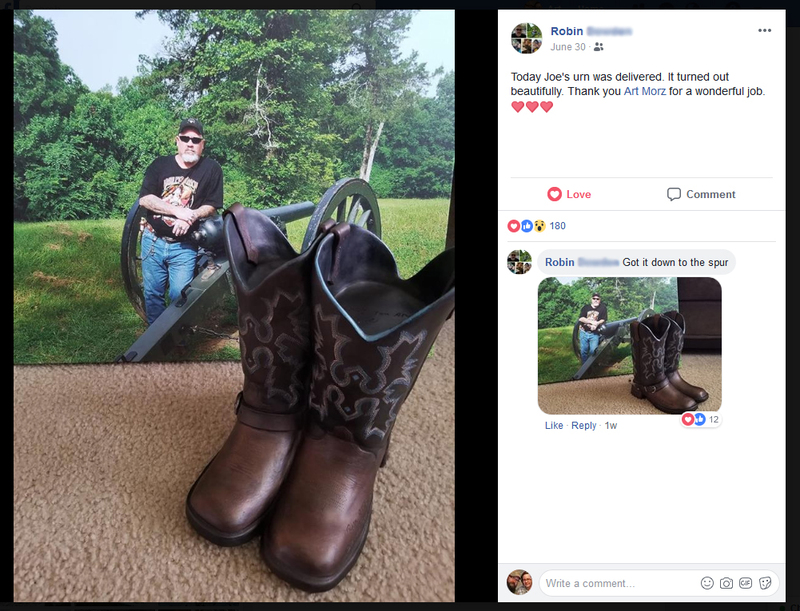 It was decided that the most fitting tribute to remember him would be his cowboy boots. 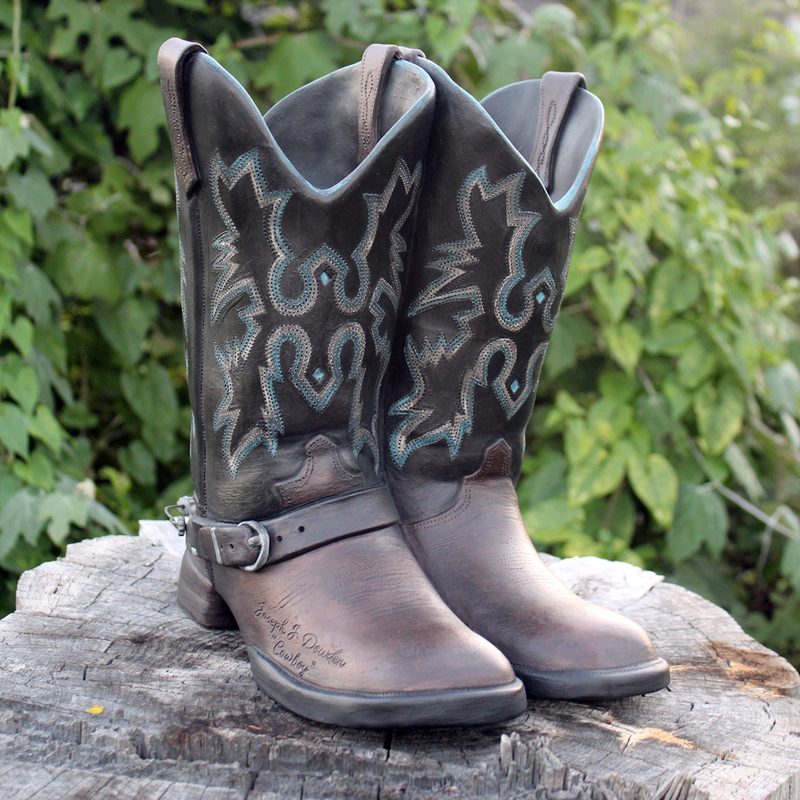 His wife, Robin, sent us pictures of his most recent pair of boots, of which he wore with a spur on his right boot. 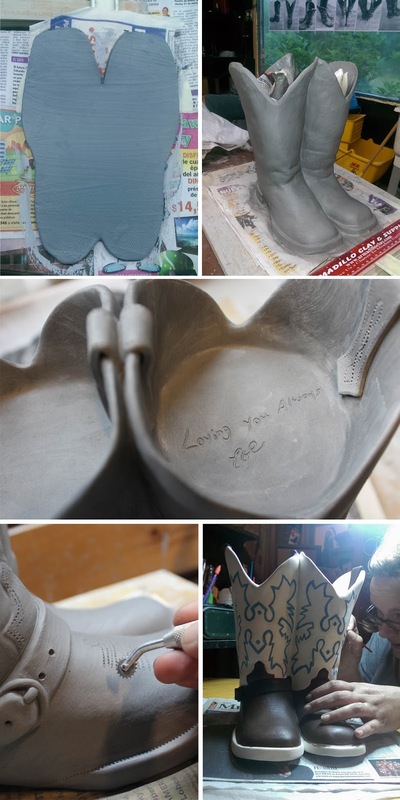 We used these pictures as our references to sculpt Joe's Boots. Additional personal touches included engravings of his name, dates, a handwritten note to Robin. 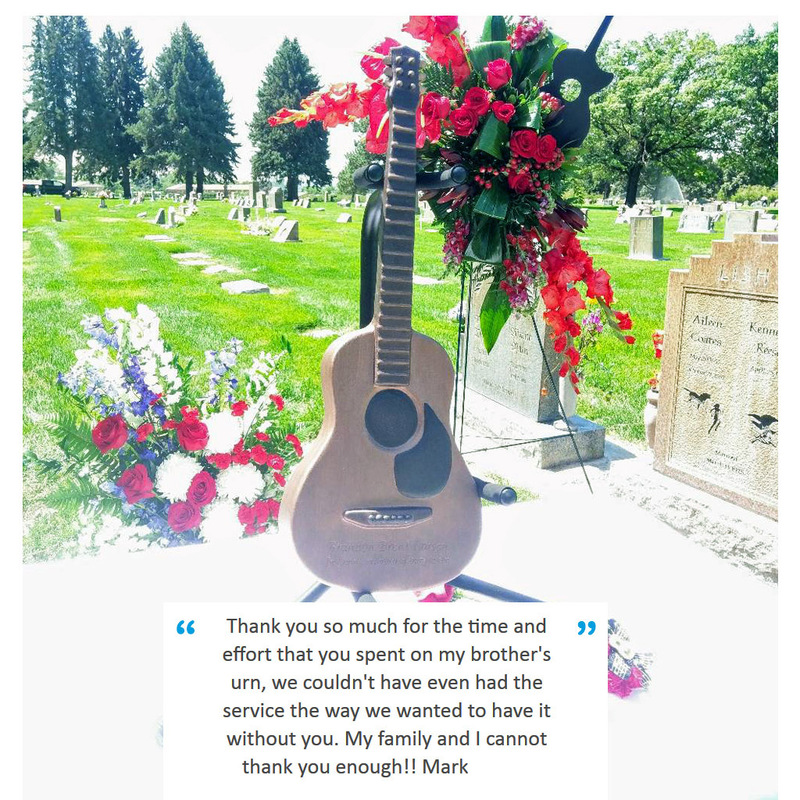 We were able to hand deliver Joe's boots to his family. 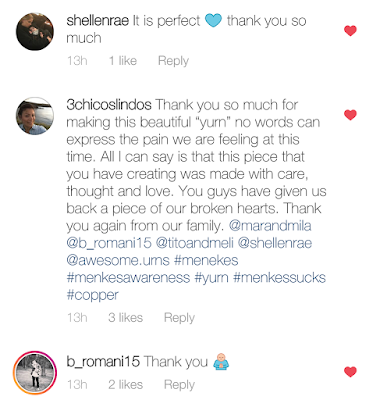 We were so touched by their warm response and kind words for Joe's memorial. We greatly appreciate Robin and her sister, Laura, for working with us to honor him through our artwork.